This year we've been closely looking at Security Definitives with MA10 codes and not always noticing other code changes. Well, we weren't looking very closely last year either. On MachinMania Roy has a comment from 'Robert' about the NAFAS Flowers Retail Booklet issued last year. 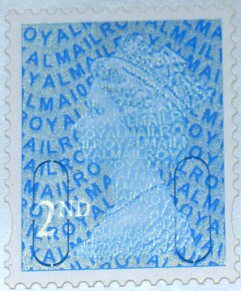 This has a previously unreported variation in the security overprint, in that the 'A' of MAIL is missing in one position, to the left, just above the security cuts. Like many of last year's 1st class stamps, the security layer is not very good and is very difficult to reproduce, so my thanks to Richard P who has once again achieved what I could not! This is a variation, not a variety - all four stamps in every book examined has this A missing. But why, and how? It's not as if it's a gradual fade off towards a corner, and it's not in only one place on the cylinder. Most people will have this stamp in the booklet, but single ones make added interest. Many dealers will have kept the flower stamps because they are separately catalogued and there will be space for them in pre-printed albums. How many have kept the single stamps as well? Time to start looking more closely at all stamps, and kiloware! The 1st class gold Large Letter Business Sheet has now been found with the MA10 code. The printing date on the sheet header is 09/03/10, thanks to Richard for this image. As you can see, the MA10 code is to the left of the eye, and the source code MBIL code is in the top right sector behind the head. This is another change too the source code, as the previous Business Sheets had (RO)YBLMAIL in the top line at the top right. 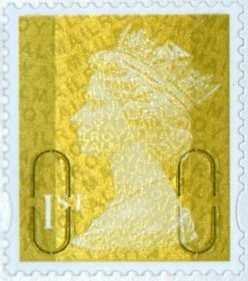 My visit to Cumbria last week was largely free of philatelic interest but I did notice gold horizon labels in use at Grasmere village PO, where they had been "for a few weeks". The postmaster reported, as others have done, difficulty removing them from the backing paper, suggesting that the perforations didn't actually make it any easier. Not much news to report, save that we now have the 1st class MA10 sheet stamp and hope to add it to our shop system before the end of the week. Meanwhile you can click on these links for the London Festival of Stamps products, and the MA10 security stamps and FDCs. These and more can also be found using the ordinary search facilities on the shop. All will be quiet on the blog next week as we are taking a break from 5-12 June. Back online by Monday 14th invigorated and refreshed ready to deal with everything that the postal system and internet sends our way. 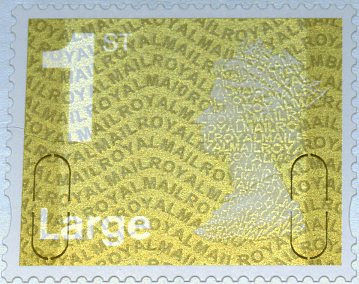 Of course the first thing to do will be to add the special postmarks for the House of Stuart stamps and the Mammals retail booklet both of which are issued on 15 June. We will have FDCs of the set, MS and booklet but only a limited number with a small choice of handstamps. We have the Mammals booklets including cylinder books. First impressions are that the colour registration particularly for the magenta is very poor on many, and the cyan has a slight right shift on most of our cylinder books affecting the inscriptions and, perversely, the cylinder number itself which doesn't fit into the 'reversed out' other colours but has a white edge to the left! Pictures of actual books later, this is the publicity picture. Should be popular with consumers.